Rozmurat Arnakuliyev studied with Prof. Nikolai Berdiev at the Tchaikovsky Music Academy in Kiev and graduated with distinction. He completed his studies at the Conservatoire National Superieur de Musique in Lyon under Prof. André Jung, Prof. Pierre Dutot with the "Grand Prix". Intensive studies combine him with Prof. Timofei Dokshitser and Prof. Edward H.Tarr. He is the participant of numerous international competitions and music festivals. He began his professional career as a soloist of the National Symphony Orchestra of Ukraine and the brass quintet "Ukrainian Brass". Rozmurat Arnakuliyev has performed under the direction of such renowned conductors as Dimitri Kitaenko, Kent Nagano, Roman Koffmann, Virko Baley and Hobart Earle. 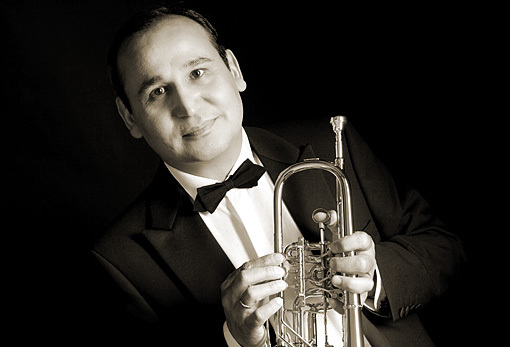 From 2000 to 2008 he was a solo trumpeter at the Palladium Theater Stuttgart, the Ensemble Brass Academy Stuttgart and the Sakrales Brass Ensemble. As a soloist, chamber musician and orchestra musician, he recorded several CDs and TV shows and traveled to the USA, Japan, Korea and almost all over Europe.